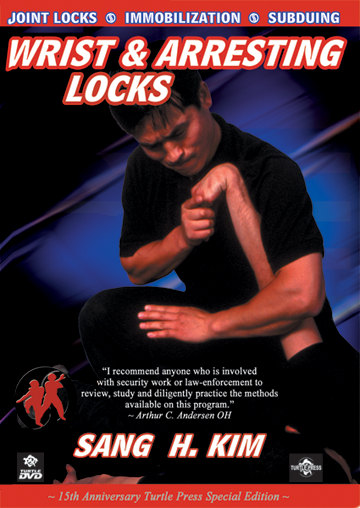 Sang H. Kim has revised the Joint Locks video with added instruction including focal points for every technique. Posted in Instructional Videos, Junsado. We are pleased to announce that the Junsado Empty Hand Skills Video App is available now. 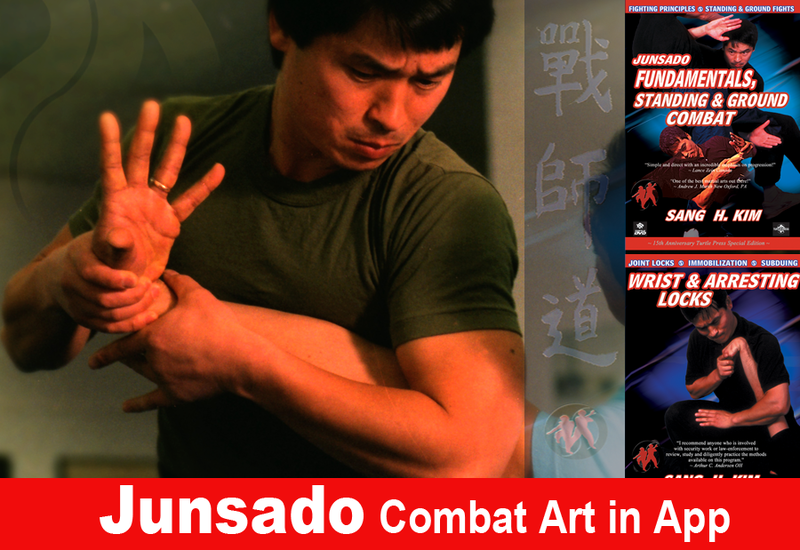 The Junsado App presents over 100 tactics and strategies of realistic unarmed combat. Former special agent Sang H. Kim demonstrates each technique at walk through and full speed then shows you how to effectively apply it against an opponent. 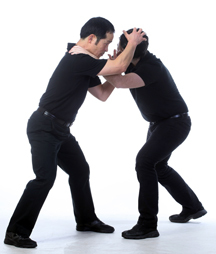 In the Junsado Ground Combat video ($2.99), you’ll learn quick effective escapes from common attacks on the ground including head locks, pins, chokes and striking attacks by a standing opponent. Counter throws, locks & pins with principles like triangular force frames and coupling force. Junsado Weapon App will be released soon as well. Thank you for your support and practice of Junsado! Ground kicks are versatile weapons in a fight. Especially in an unexpected and unintended situation like falling or sitting. Unexpected as it is, the situation may work against you, but switching the view other way around, you can change the odds. So be the cause of the unexpected change. To increase your ground fighting skills, diversify your ground kicks by mixing front, side, and hook kicks aimed at multiple targets such as the ankle, shin, kneecap, groin, and rear knee joint. Ground kicks are used to keep the standing opponent at bay, to attack the body parts that are most essential for mobility, to diminish his access to you by injuring his joints, or to end a fight by powerfully kicking a fallen opponent. Below are three essential Junsado ground kicks that are easily adaptable to various fighting situations. Junsado Ground Front Kick is versatile weapon to attack the groin, stomach, face, and other body parts that are essential for mobility. 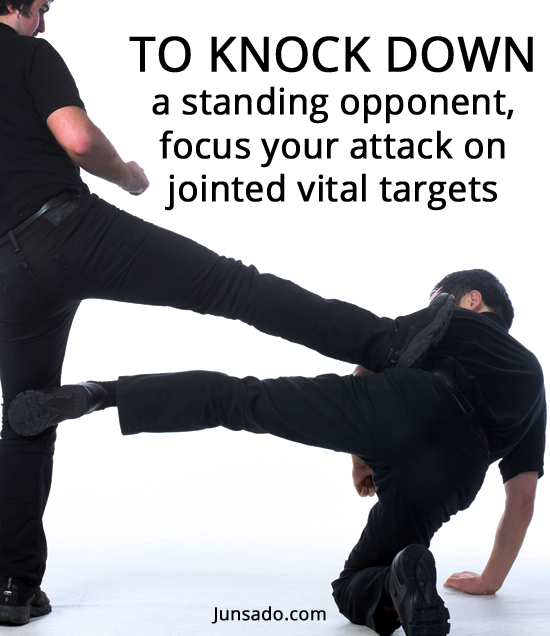 Function: Use a ground front kick to keep a standing opponent at bay when you are on the ground. Method: Plant your hands on the floor on both sides of your hips. Bend your supporting knee and stretch your kicking leg half-way out toward the opponent’s knee. For repeated kicks, keep your hips off the ground while moving around, like a crab, to adjust your body position according to his movement. Key Points: It is not wise to stay on the ground in any fight, except perhaps in a sport fighting tournament that has rules and a referee. In reality, you should get up as quickly as you can and keep yourself mobile. 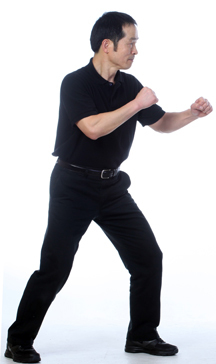 Run away as early as possible in the fight, especially if there are multiple attackers. However, if fighting from the ground becomes inevitable, you should know how to survive. 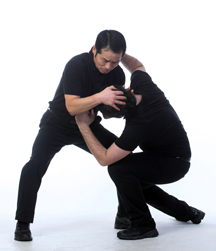 The first goal is to damage the lower limbs of the attacker while assessing your exit strategy. Be like a little animal that would bite anyone who comes near. The secondary goal is to take him down and then get up to run away. 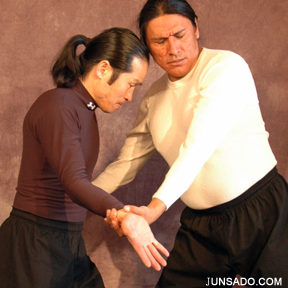 Junsado Ground Side Kick is a good skill to stop an incoming opponent or to strike the neck and head of a fallen opponent. 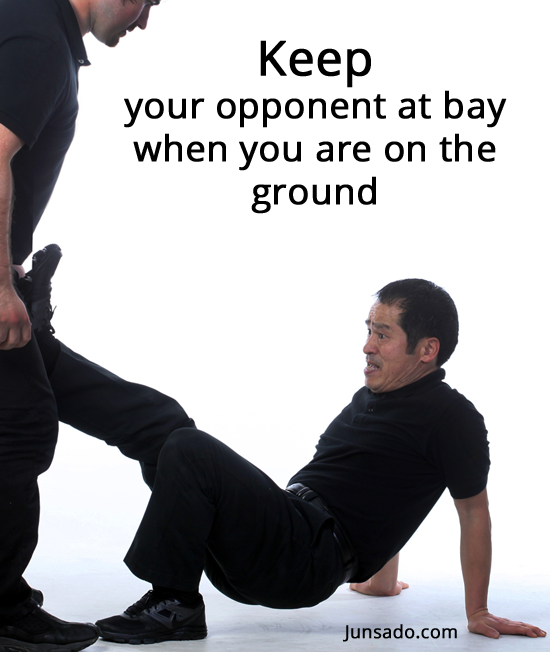 Function: Use the ground side kick to stop a standing opponent from approaching you on the ground. Method: Put both hands on the ground on the opposite side as your kicking leg, kneel on the supporting leg, turning your body sideways, and kick to the side with the blade or the bottom of your foot. Key Points: Use the wide blade and the bottom of your foot as a weapon by turning it horizontally to push at the opponent’s vertically standing legs. Or kick the torso or head of a fallen opponent to prevent him from engaging in grappling with you. Adjust your body position as the situation evolves to accomplish three goals: keep him at bay, inflict pain, and run away. Junsado Ground Hook Kick is highly effective in pinpointed striking at the groin and knee joint. Function: Use the ground hook kick to take down or knock down a standing opponent from the ground. Method: Put both hands on the ground on the opposite side of your kicking leg. Kneel on the supporting leg, turning your body sideways. 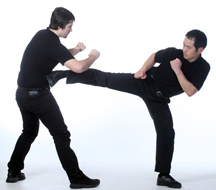 Chamber your upper leg and kick with the instep at the opponent’s groin or rear knee. Key Points: The ground hook kick is less effective for keeping an opponent at bay but highly effective in pinpointed striking at the groin and knee joint. It is also a good choice for striking the neck and head (of a fallen opponent). To increase your success rate, diversify your ground kicks by mixing front, side, and hook kicks aimed at multiple targets such as the ankle, shin, kneecap, groin, and rear knee joint. Once you have inflicted serious pain or damage on a particular vital area, for example the calf, then focus your attack on that area to take the opponent down. If he blocks, attack elsewhere, then resume attacking that same spot with renewed intensity. 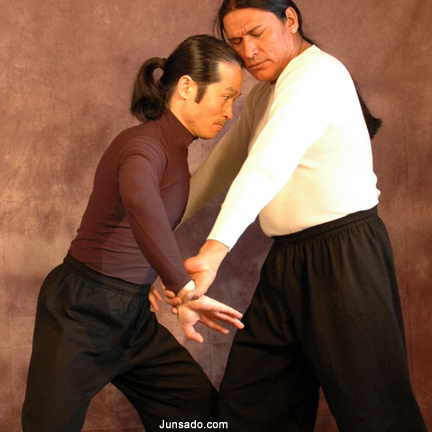 This article is an excerpt from Junsado Fundamentals, Standing and Ground Combat. 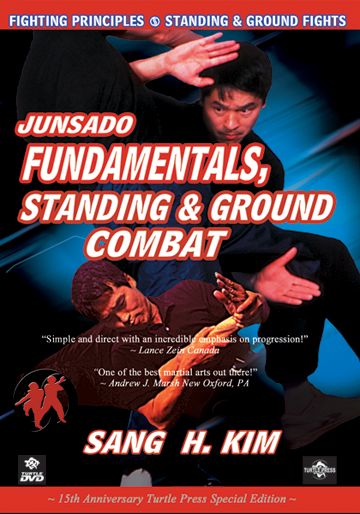 Junsado Fundamentals, Standing and Ground Combat ($5.99, over 650 full color photos) is available exclusively in e-book format for Kindle (Amazon.com). Your initial response is the key to success in ground fighting. Your first move sets the tone of the fight. It affects what techniques follow and eventually who dominates. 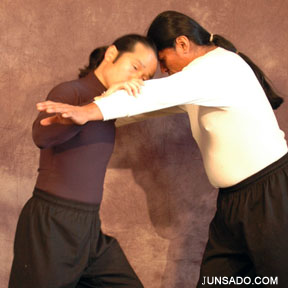 Many of the Junsado responses to being pinned or immobilized on the ground rely on your initial movement as a defender. For example, when you make your body smaller or draw your limbs into your center, you not only control your body better and conserve energy, but also make yourself less vulnerable by reducing the number of exposed vital targets. As a defender, particularly on the ground, it is critical to draw your knee and elbow closer together toward the center of your body to protect yourself, collect your inner force, and strike powerfully when needed. Bending the large joints and drawing the limbs in toward the center of the body creates three potential advantages: control, range of motion and twisting force. On the ground, keeping your arms bent and close to your body increases your control and reduces the opportunities for your opponent to control you. For example, if you keep your arm straight, your opponent will likely try to lock it or break it (1). 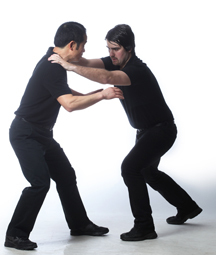 When you keep your arms bent, with your elbows close to your body, you not only defend against an arm lock, you put yourself in a strong position for twisting, pulling, pushing, or resisting (2). From this position, you can put your entire body weight into your techniques by using your legs and torso to initiate and follow through without losing control of your body as well as the situation (3). The greater the range of the motion in an arm or leg, the greater force you generate. By bending your knees or elbows, you put yourself in a good starting position for a strike, kick, push or thrusting movement. Bent joints store potential power. For example, when you are flat on your back with your legs outstretched, it is impossible to lift your body more than a few inches off the ground. But if you bend your knee, drawing your foot close to your hip and planting your foot on the ground, you are in a position to powerfully push off the ground and thrust your hip and torso upward. The same is true of your arms. By drawing your arms in close to your torso with your elbows bent, you create the possibility of striking or pushing the opponent over a greater range of motion than if your arms were already partially extended. When escaping from a lock, pin or hold, a twisting movement is generally easier to apply than a straight line movement. The same is true of takedowns; it is usually easier to take an opponent down by rotating your own body and whipping the opponent around it than by throwing him straight down. When a takedown utilizes a torquing action, it mitigates the resistance of the major muscles and joints of the opponent’s body and allows you to take him down with less work. 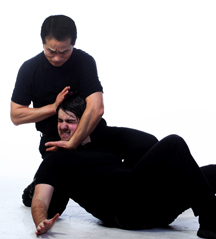 In grappling against a bear hug for example, if you try to escape by going straight down or directly forward, it is nearly impossible to be successful, especially when the opponent is stronger than you are. However, if you lower your body while twisting downward at a fifteen-degree angle, you have a better chance of escaping. 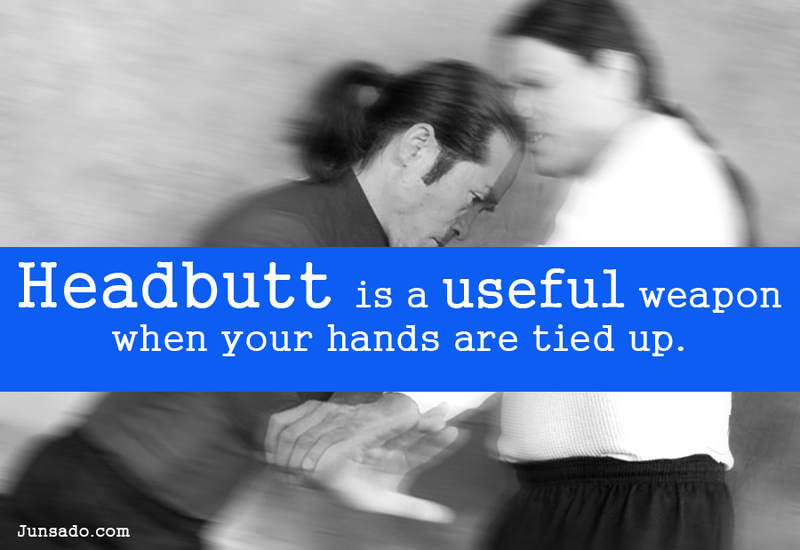 By doing so, you create more sensory demands for your opponent to process, increasing his distraction and your control. More importantly, the twisting action often creates a throw or takedown in the direction of his blind spot because the twisting motion produces an angular or diagonal movement trajectory. Taken together, a twisting motion can provide you with pivotal advantages to maximize your potential while mitigating the opponent’s strength. 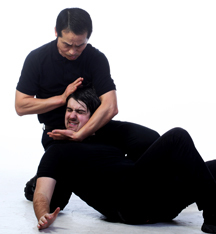 In wrestling against a bigger opponent or untangling a lock on a vulnerable body part, such as the neck, it is useful to use your entire body as leverage. 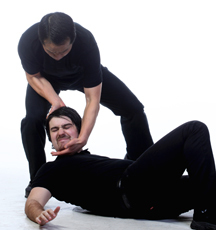 For example, as your opponent chokes your neck with his right arm from the front, it is hard to escape using your hands alone. In this case, you can forge his arm to your body by pulling it down against your upper chest and then twist your torso to manipulate his arm. Since your torso has greater weight behind it, you can generate greater impact on the joint of his arm when you rotate your entire body. For fighting purposes, the body can be divided into three regions: the head/torso region, the legs and the arms. Each of the regions has both major and minor parts. The hands and feet are the minor parts of their respective regions, while the legs and arms are the major parts. The same is true of the head (minor part) and the torso (major part). Together, however, the head and torso make up the most important power source in the body. Correct alignment of your head and pelvis is central to containing and mobilizing the force waiting to be unleashed from your body. Mechanically, the head and torso work together as the axis of power when we move. Imagine a line running from the center of your pelvis to the crown of your head. You can generate significant force in every technique along this axis. Your legs support the axis while transmitting force up from the ground through the upper body. 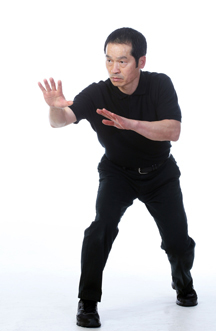 Your arms and hands are the tools that deliver the force via the axis; your chin and forehead stabilize your posture. The head-pelvis axis (HPA) runs through the center of the body (the red bar). The HPA is supported and controlled by the lower limbs (the white bars). Jointly, they augment the force of the arms and head (the black bars). In twisting, the head-pelvis axis drives the arms for striking or grappling. Rotating your entire body along the head-pelvis substantially adds more force than simply striking or pulling with your arms. When moving forward or backward, the head-pelvis axis is the root of power in both pulling and pushing. The head-pelvis axis unites the power of your legs with the weight of your entire body, allowing you to move a much heavier opponent than you could by pulling or pushing with only your arms. The key to applying the power of the head-pelvis axis is controlling the alignment of your head and torso. To find the correct alignment, stand in fighting stance with your chin tucked slightly down so that the crown of your head is aligned with the center of your pelvic floor. Your spine should be neither upright nor hunched. Tilt your upper body slightly forward while relaxing your shoulders, keep both knees bent, and poise your body as if you are about to take off running. This creates a dynamic stance, in which your body is ready to be unleashed. A properly-formed head-pelvis axis enables you to better control the speed and power in your techniques, delivering maximum impact to your opponent, by helping you contain the intrinsic potential power of the torso. Proper alignment of your body, therefore, is the key to establishing your physical center, creating a balanced foundation from which to launch your techniques. You also gain economy of motion because you can employ long- or short-range attacks without changing your stance or using additional preparatory techniques. You simply shift your weight to the back and front to attack or defend as needed, without breaking the balance and force structure of your current posture. This natural containment of your power not only makes you stronger but also reduces telegraphing when initiating techniques. Most importantly, when you have a strong head-pelvis axis, you project an image of discipline, strength and confidence that intimidates opponents even before the fight begins. Rotating your entire body along the head-pelvis adds substantially more force than simply striking or pulling with your arms. Tilt your upper body slightly forward while relaxing your shoulders, as if your body is ready to be unleashed. 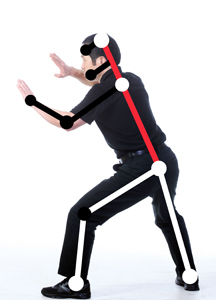 A properly-formed head-pelvis axis enables you to better control the speed and power in your techniques, delivering maximum impact to your opponent.